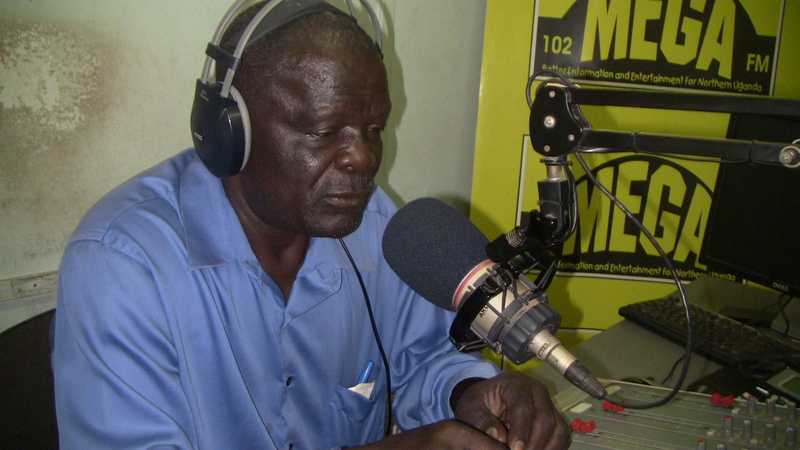 Lacambel in-studio at 102 Mega FM Gulu, Uganda. KAMPALA, Uganda – There is a corner in towns and cities across Uganda where there stands a memorial to the lowering of the Union Jack in 1962, which signaled the sunset of British colonial rule and the dawn of independence. In the northern city of Gulu, the monument is situated near the building which houses Mega FM, charged with transmitting a powerful message not only in Uganda, but to many parts of East and Central Africa. John Lacambel, a 64-year-old father of 13 children, has passed this independence memorial every day for the last 11 years as he enters the Mega FM studio. As he strides down the station’s hallways, he passes certificates of appreciation which adorn the walls. These accolades have been showered on Mega FM to support its peace-building efforts via the radio dial in northern Uganda. Leading these efforts is Lacambel. Admired by colleagues and loved by listeners, he has made this community radio station one of the Uganda’s most popular through his hosting of its longest running program. Like clockwork, he takes his seat in front of the microphone, puts on his headphones, and slides up the volume control in order to begin his program. In the Luo language, he says, “Hello! This is Lacambel here at 102 Mega FM. It is Thursday and the time is now 10 p.m. This is Come Back Home.” Come Back Home is known as Dwog Paco in Luo, a language commonly spoken in Uganda, Kenya and DRC. 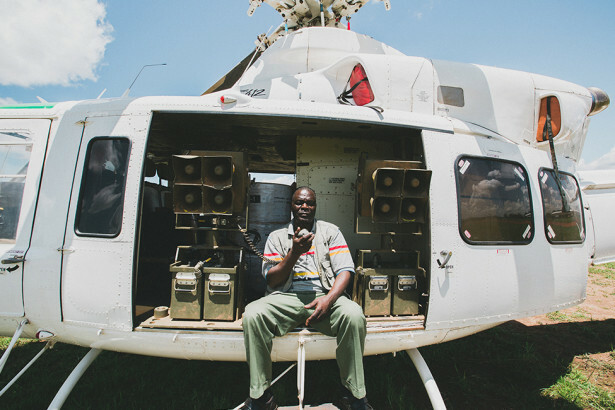 During the height of the 20-year-long brutal war with the Lord’s Resistance Army in northern Uganda, Lacambel was broadcasting Come Back Home up to three times a week to counter LRA propaganda. As part of their reign of terror, the LRA would tell abductees that if they returned home, they would be arrested by Ugandan soldiers or killed by family and friends in the community. A warrant for Joseph Kony’s arrest, along with three of his deputies, was issued by the International Criminal Court for war crimes and crimes against humanity. Finally driven out of Uganda, the LRA is now believed to be located somewhere in the area between Central African Republic, South Sudan and DRC, terrorizing people wherever they go. Lacambel’s phone rings frequently. “Yesterday I received a call from someone in eastern DRC. They told me they listen to the program and wanted some assurance that the LRA was not in their village,” he says. Come Back Home is retransmitted via shortwave by the Uganda Broadcasting Corporation, or UBC, and can be heard where Kony is believed to be in hiding. With the help of U.S.-based organization, Invisible Children, Mega FM is trying to reach a much larger audience with its signal. David Olara, 31, was born-and-raised in Gulu, Uganda. He’s been listening to Come Back Home since he was a boy. This is when his family moved him into the town, fearing he would be abducted with other children into the LRA. Photo courtesy of Invisible Children. Nicky Afa-ei is program manager at Mega FM. He says Come Back Home was originally started to give the parents of LRA abductees a voice. They would go on-air with Lacambel and plead for their children to return. Moses Odokonyero used to be a news editor at Mega FM. He is now a program manager at the Northern Uganda Media Club, or NUMEC, a training centre based in Gulu. A great piece on the power of peace radio in Uganda by my colleague Adam Bemma.